Ask fellow campers about "Countryside RV Park, LLC" and nearby attractions. Very clean. Quiet at night. Conveniently located just a few miles south of the town of Dillon. Beautiful views of surrounding hills and mountains. Plenty of well-maintained grass throughout park. Despite their website saying winter rates (a flat $25 per night) go into effect Nov 1st, we were pleasantly surprised to find they started mid-October. The downside is the office is closed for the winter and water has been turned off to ALL the pull-through sites. There's an easily overlooked sign at the self check-in desk (located just outside the office door) which explains overnighters can only park in the pull-through sites and water is available for filling tanks at back-in site M1, which is directly in front of the office. In actuality, any of the unoccupied back-in sites located on rows B and M can be used to fill your tank, but then you must move into one of the pull-through sites. We watched numerous overnighters get settled into a site only to discover there was no water then trying to figure out what to do about it. We made several new acquaintances by explaining the solution, so I guess there's an upside to the confusion. Since the interior gravel roads are somewhat narrow in places and the pull-throughs at a shallow angle to the roads, long unhitched rigs can sometimes barely fit into the sites and stay clear of the roads on each end. This isn't a show stopper and maneuvering through the park is easy due to the road layout. Voltage and water pressure (at sites which have it) is excellent. Very s-l-o-w AT&T data. Fast Verizon data. We camped at Countryside RV Park, LLC in a Fifth Wheel. Don't miss Bannack State Park ghost town just down the road from the RV park. Google it. We stayed for 3 nights to visit relatives and get ready for the next leg of our trip. The sewer connection is a bit high making it difficult to get a good drain. We camped at Countryside RV Park, LLC in a Fifth Wheel. Shopping is in Dillon at the Safeway where we also found the cheapest diesel. We found propane at Rocky Mountain Supply behind the Cenex. Stayed just two nights. I did laundry and it was fine - $6.00 for two loads. Didn't use the restrooms or showers. The park is in a very lovely location and there's plenty of room between you and your neighbors. It's near a small overgrown creek and the bugs were definitely everywhere, although as far as my dog is concerned, they're just little treats. They don't have cable and we weren't able to get any stations on the antenna, but it's open so satellite should work well. However, they had one of the very best wi-fi signals we've had so far - and we were able to use the firestick both nights, no problem. You're about ten minutes from the downtown area of Dillon - and within driving distance to a couple of ghost towns. It's a cool little area. This was a nice place for just a couple of nights and we would definitely come back if we're in southwestern Montana again. We camped at Countryside RV Park, LLC in a Motorhome. For some of the best BBQ around, try the Branding Iron in Dillon. One of the best pulled pork sandwiches we've ever had. The owner trained at Franklin's Barbecue in Austin - so it's a taste of Texas BBQ in Montana. 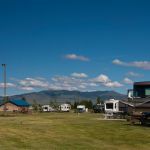 Very nice and peaceful RV park in the wide open countryside with the view of the mountains!!! The grounds are very well maintained, gravel fairly level spots and lush green grassy area around each spot. Bathrooms and showers are very cozy and clean, and so is the laundry space. Great internet signal too. The owner/manager lady is very friendly and helpful - I had a package that got there after we left and she forwarded it to me at no cost! We stayed there for a week and enjoyed it a lot! Will definitely stay again when in the area. We camped at Countryside RV Park, LLC in a Fifth Wheel. Make sure to check out Bannack State park - it's an awesome ghost town! Totally non-commercialized with very little visitors. Beaverhead County Museum is definitely worth a stop. We stayed in site 2 on both ways to and from Glacier National Park. Clean, nicely laid out, gravel sites (but compressed and level), decent water pressure, WiFi was OK. Showers and bathrooms were spacious, clean, and presentable. Campground is laid out in an oval. You can see your neighbors, but are not right on top of them. We will stay here again if in the area. Easy on and off I-15. We camped at Countryside RV Park, LLC in a Motorhome. 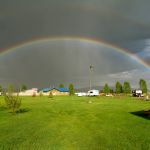 Campground is about half an hour from Big Hole National Battlefield, site of a battle between the U.S. Army and Chief Joseph and the Nez Perce. 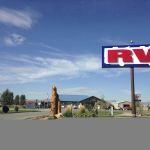 Nice open campground and an excellent overnight stop; easy access off I-15. However, the are often filled during the summer so make reservations early. Great views of the mountains from almost every site. While no cable or OTA TV, it was not a problem for us. Inhabited by two birds we'd never seen before, including a yellow-headed blackbird. We camped at Countryside RV Park, LLC in a Motorhome. We really enjoyed the country setting and peaceful atmosphere. We stayed a week and would like to have stayed longer. We camped at Countryside RV Park, LLC in a Motorhome. Easy to get in and out of; close to the freeway. Bathrooms were clean. Found a space we could pull through with a 30 foot travel trailer without having to stick out into the driveway on either end. We camped at Countryside RV Park, LLC in a Travel Trailer. Quiet, clean, well-maintained park, with easy access off I-15. Good gravel interior roads. Level, roomy gravel sites, with grass in between. Sites are angled so you're not looking right into your neighbor's window. Large areas of grass to walk dogs. No antenna TV reception, but good working WiFi. We would stay here again. We camped at Countryside RV Park, LLC in a Fifth Wheel. Don't miss Bannack Ghost Town (at Bannack State Park). This Ghost Town is the real thing; not a tourist-trap like some others. Thank you for reviewing our park. We're glad you enjoyed your stay. Hope to see you again along your travels! Location is great off I-15. Sites are large and long with plenty of room between. No trees but a spectacular view. Facility is very clean. No gas at this exit but 1 exit away is good. My site was perfectly level. We camped at Countryside RV Park, LLC in a Motorhome. Easy in easy out, close to I15 but quiet. Easy Drive to Dillon. Wifi worked, lots of room to walk dogs. Sites were well spaced. Will stay again when in the area. We camped at Countryside RV Park, LLC in a Motorhome. See Bannack State Park, the Beaverhead Museum, Beaverheade Rock. Easy Drive to Virginia City. Nice looking park, no shade at sites, sites are wide and long, problem with back in sites is that water and electric connections are at front of site so you will need 40 to 50 feet of water hose and electric cord to reach them, site was fairly level, nice grassy area in middle for everybody's use, free wifi was average. We camped at Countryside RV Park, LLC in a Motorhome. Thank you for reviewing our park! Please come back and stay with us again the next time you're in the area. Beautiful and well keep RV PK. Only thing it didn't have was TV. Laundry was only $1.50. We camped at Countryside RV Park, LLC in a Fifth Wheel. Dillon is the place to stay for fishing. Great fishing guides available and really close. Our neighbors stayed for a month fishing. There is a state park about 40 minutes away. This park is centrally located to many attractions. Bannock State Park, a ghost town as it was in the day. There is a scenic byway. a crystal park where you can dig crystals, Nevada City and Virginia City are within 50 miles. The small town of Dillon has a very interesting little museum of local history. Be sure to check out Sparky's Garage for delicious burgers and bbq. The decor is pretty neat too. Bannack State Park is a must see. Also Clark's lookout is a nice quick hike with outstanding views. We love the corner spots here. We'd love to explore the area next time. Bannack State Park is a short drive away and well worth it. Very well preserved ghost town. Dillion is a cute town with all the things you would need. Take the trip up to old west town of Virginia City. Very interesting. Didn't do the hot springs, but two within 50 miles. Dillon is a small town, but fun to go and look around. Bannack State Park is a must see. It is only 17 miles from the RV Park. Dillon is a neat little town. Bannack State Park is nearby and is one of the neatest places in the state. I highly encourage everyone to visit it. Two very nice grocery stores in town. Take the time to visit Bannack State Park, a historic ghost town with a large number of original building that can be explored. We stayed an extra day in order to explore the town of Dillon. Western Mont. College is located there and the campus is beautiful. All the buildings appear to have been restored and makes for an inspiring campus. The town itself is fun to tour as well. We even discovered a Patagonia Outlet store offering great prices and remember, Montana has NO Sales Tax! For a great meal be sure to visit Sparky's Garage...you will not be dissapointed in the food or the large assortment of craft beers. Trip to Bannack State Park is worth it. Taco bus in Dillon is GREAT place to eat. Try the Carnitas. Forget Sparky's in Dillon. Over rated! 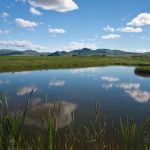 Good location for Bannack State Park and fishing camp. We didn't unhook to do any sightseeing so we don't know what was around there. Are you affiliated with Countryside RV Park, LLC ?